Aspiring European or US PGA Tour players may be honing their skills in the tropics at a remote golfing outpost in the South China Sea from 2011, as the Hank Haney Golf Academy at Mission Hills Haikou gets ready for business. 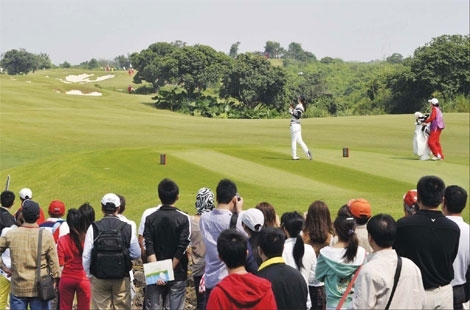 If future Tiger Woods aren’t sold on what may well become Asia’s top golf school when it opens on Hainan Island in February, older players will get to check out the ambitious resort that houses it during the World Cup of Golf in November. The tournament, which is going biannual from next year to reflect golf’s new Olympic status, will offer a record prize fund of $7.5 million (5.7 million euros). Also, Mission Hills Haikou is rumored to be seeking ways of poaching the HSBC Champions, dubbed Asia’s major, from Shanghai in either 2011 or 2012. "The property itself is destined to become Asia’s most memorable golfing destination," says Tenniel Chu, executive director of Mission Hills Golf Club. "Having Hank’s first China academy here will no doubt draw even greater attention from North Americans, Europeans and Asians alike." Kyle Brisch, who flew over to the island’s provincial capital of Haikou several months ago to get the project ready, says the academy’s main goal is "training champions". "We want to develop golfers at a collegiate level or above in the United States," he says. "To my knowledge, I don’t believe there’s anywhere in Asia quite like this. I mean, how many resorts can you stay at and play 10 courses?" Gary Heng, who has been bringing Singaporeans to Chinese golfing hot spots like Hainan and Kunming, in Yunnan province, for over a decade, says getting golfing etiquette to an international standard may prove one of the biggest fjords to cross. "People come here and think it’s a resort, whereas in Singapore we don’t have caddies, so we are used to replacing the divots ourselves. Here they don’t do that," says Heng, an agent for Golf Hub Tours & Travel. Built on one of the most ambitious golf resort projects the world has ever seen, the academy will offer world-class coaching for roughly half of what it would cost in the United States or Europe, as well as year-round sub-tropical weather conditions. PGA instructor par excellence Hank Haney, who was ranked No 2 on Golf Digest’s 2009 list of "America’s Top 50 Teachers", will serve as the director of instruction at the facility, the first of its kind in Asia to offer comprehensive elite development programs. Students will be charged 258,000 yuan (29,350 euros) for a year’s instruction from September to July, which includes room and board, and morning-time education in downtown Haikou. The state-of-the-art golf facilities include a 2,000-square-meter indoor training facility, 15 fully-equipped hitting bays, ball-flight tracking technology – and a strong emphasis on fitness and honing one’s mental game. "Our academy building and practice facility alone would blow away anyone from the States," says Brisch. "But there’s a lot more to golf than just crossing off the X’s and O’s of the technical game. What makes us so unique is that we offer the whole package." The academy serves as part of an under-construction golf resort that opened in March and aims to cover 21 square kilometers within 10 years. It will feature 10 courses – the finishing touches are now being put on the 6th – a village full of luxury brand boutiques, multi-million-dollar apartments and villas, the world’s largest mineral spa, a hotel built in the shape of a volcano and a 10,000-sq-m aquatic theme park. The current hotel already has 12 world-class restaurants. The resort is an offshoot of Mission Hills’ combined clubhouses in Shenzhen and Dongguan, across the border from Hong Kong, which are together billed as the world’s largest golf club featuring 12 courses designed by the top names in the sport. However, planting a flag on the volcanic isle has not been so easy. Some conservationists have complained about the Haikou resort’s impact on the local ecosystem, arguing that it has already displaced local fishermen and threatens wildlife such as the endangered Hainan gibbon. The finger of blame is not pointed exclusively at Mission Hills, but at the 100 or so golf clubs planned for the island in the coming years – it currently has about 27 – despite a moratorium on golf-course construction on the mainland in recent years. One advocacy group believed it had acquired the rights to over 320 hectares acres of land to build a forest park in northern Hainan – in the area now occupied by Mission Hills – before it found out otherwise in 2007. "There have been many misunderstandings about the scope of our project," says Chu. "The site in Haikou was a desolate area with limited water, trees and soil. There was no agriculture and no infrastructure whatsoever. "We envision a similar snowball effect to what we saw in Shenzhen when we built our first resort: An area that was once a wasteland is now home to some of the largest multinational corporations in the world." Although staff claim Mission Hills chose the northern location for its better weather conditions, it simply may not have been able to find space down south in the tourism hot spot of Sanya. Regardless, its publicity machine is swinging into full action to support a government initiative launched in January to turn Hainan into an international tourism destination like Phuket or Bali by 2020. Several weeks ago, the club organized a Star Trophy pro-am tournament at its premier Blackstone course, giving Hollywood celebrities and sporting icons an excuse to grace its hallowed doors. During the televised Oct 28-31 event, Haney grew impatient with heartthrob Matthew McConaughey’s stubborn refusal to change his swing, Katherine Zeta-Jones marveled at the facilities, and swim king Michael Phelps exercised his Olympic determination to win. "This tournament was the first in Asia involving world-class stars, professionals and amateurs," says Chu. "It represented a quantum leap in quality for Mission Hills." The red carpet also included actor Christian Slater, and golf legends Greg Norman, Nick Faldo and Annika Sorenstam. The winner’s check of $1.28 million, which represents the biggest individual prize in Asia, went to Mexico’s Lorena Ochoa after she sank a six-foot birdie to finish with a four-under-par 142. Colin Montgomerie, who finished two shots back after picking up a two-stroke penalty when his caddie moved an advertising board, stormed off the course upon learning of the infraction. But all news is good news when it comes to spreading the word. "You get the feeling, since the Star Trophy, that a lot more people are coming here. It happened very fast. We got 605 golfers this past Saturday," says Brisch, one of three or four pro instructors from the US who will teach at the academy. Sport is a booming industry in China, despite making a mark only a quarter of a century ago, and Hainan aims to become a magnet for players from around the region and world with its regional and climatic advantages. "In the States you’re kind of cut in half in terms of where you can play. But you don’t have to deal with things like frost or snow here," says Brisch. At Sanya’s Yalong Bay Golf Club, which is stacked full of coconut trees and has a course shaped like a dragon’s claw, European vacationers appreciate the tricky sea breezes, the proximity to Hong Kong (a one-hour flight away) and Hainan’s relaxed visa policy, but bemoan the impact of development on pricing. "Played this course six times now and it is fantastic(but) check the weather as it does get hot from May to September. My first round was 38 C, which is too much for us Brits. Nearly fainted on the 13th!" Mark Henderson, who visited in May, said in an Internet posting. "It used to be reasonably priced but now, as more people from abroad play, the price has increased," he adds.